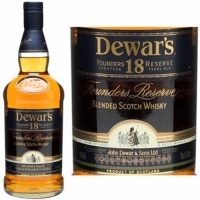 Dewar's 18 Blended Scotch Whisky is a blend of very rare vintage single malt and single grain Scotch whiskies, hence the nickname, "The Vintage. " Each bottle includes whiskies from the five single malt distilleries owned by John Dewar and Sons. The whiskies are then married in vintage oak casks. This special blend is creamy with notes of honey and marzipan.